It's been more than ten years since Big Huge Games released the history-spanning RTS Rise of Nations, and yet it still boasts a small but powerfully dedicated fan base. 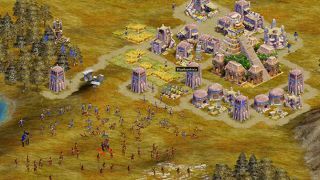 Last year, in a look back at the original game , we hoped that "perhaps one day Rise of Nations could be rescued." And now, after a fashion, it has: Microsoft has apparently acquired the rights to the game and is getting ready to unleash Rise of Nations: Extended Edition on Steam . Rise of Nations: Extended Edition features the original game as well as the Thrones and Patriots expansion, which adds new Wonders, nations, governments and campaigns to the action. But Microsoft is doing more than just tossing fans an old bone, by upgrading the visuals with improved water and textures and full-scene anti-aliasing, and also with full Steamworks integration, including achievements, trading cards, cloud saves and ranked multiplayer matches. For those of you who like to share your world-conquering adventures, there's even Twitch integration - a pleasing dash of modernity in a venerable classic. Potentially even more exciting is that the Rise of Nations IP, which was previously held by the defunct 38 Studios , now appears to be in the hands of Microsoft . It's not too much of a stretch to look at the release of the Extended Edition as a kind of test to gauge interest in the franchise, and if it proves sufficiently high, who knows? Maybe a new Rise of Nations title is closer than we think. Rise of Nations: Extended Edition will launch in June. A hard release date hasn't been announced but the game is available for pre-purchase now on Steam .